On 16 October 2015, the FQPM received an invitation from the Office of the Lord Mayor, Brisbane to attend Brisbane’s History Group Exhibition morning tea and display on Thursday, 19 November 2015. 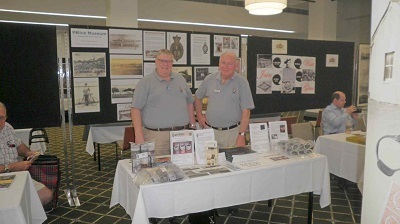 The FQPM established a display in the Sherwood Room of City Hall where a range of historic Queensland Police and recent FQPM project photographs were exhibited, together with the newly acquired FQPM banner. FQPM President Bob Burns and Secretary Ian Townsley represented the Association and fielded many inquiries about the FQPM and the Queensland Police generally. Bob and Ian were fortunate to meet quite a few close relatives of now retired or deceased officers. The FQPM wish to express our gratitude to the Queensland Museum staff Virginia, Duncan and Georgia who assisted in transporting the display items from and returning to Police Headquarters. The FQPM are now registered with the Brisbane History Group and will take the opportunity to attend future events organised by the Group.